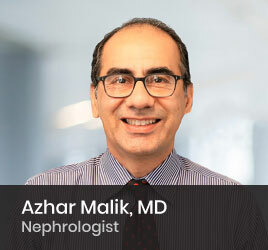 Dr. Malik was Chief Medical Resident at the Catholic Medical Center of Brooklyn and Queens. He was appointed the Medical Director of Health Information Management at St. Barnabas Correctional Health Services in New York. Additionally, he is on the Pharmaceutical and Therapeutics Committee at South Florida Baptist Hospital. He is currently a teaching attending in the Internal Medicine Residency Program at Brandon Regional Hospital. Prior to joining Florida Kidney Physicians, he was the president of Brandon Nephrology. He currently serves as Medical Director DaVita Dialysis Center of Plant City overseeing the hemodialysis and peritoneal dialysis programs.